How To Assess Your Recruiting Program | sea-change, inc. The horizontal axis illustrates Speed of Recruitment. This represents the EFFICIENCY of your recruiting effort. Obviously, every practice wants to celebrate the dual successes of Efficiency and Effectiveness in Quadrant A: Fast and IDEAL (aka Recruiting Heaven). Plot your recruiting experiences on the chart. Analyze your recruiting efforts (those you carried out on your own or those you outsourced to an external firm.) Use the key below to identify process breakdowns and their root causes. Quadrant D: Typically I see outcomes in this quadrant when practices attempt to D.I.Y. (do it yourself). Perhaps you were desperate or overpursued a misguided referral. These outcomes are frustrating and costly, but you’re in good company. There is hope. If you have experience in Quadrant D, probabilities are high that you’ve inadvertently broken one of the six immutable laws of recruiting outlined in “The Six Immutable Laws of Ophthalmic Recruiting”. Quadrant C: Outcomes in this quadrant typically occur when you hire someone who made a good impression. You hired someone you “liked” (subjective criteria), instead of an IDEAL fit (objective criteria). Beware of recruiting firms who offer an arrangement for which they are paid a fee upon hire (contingency). 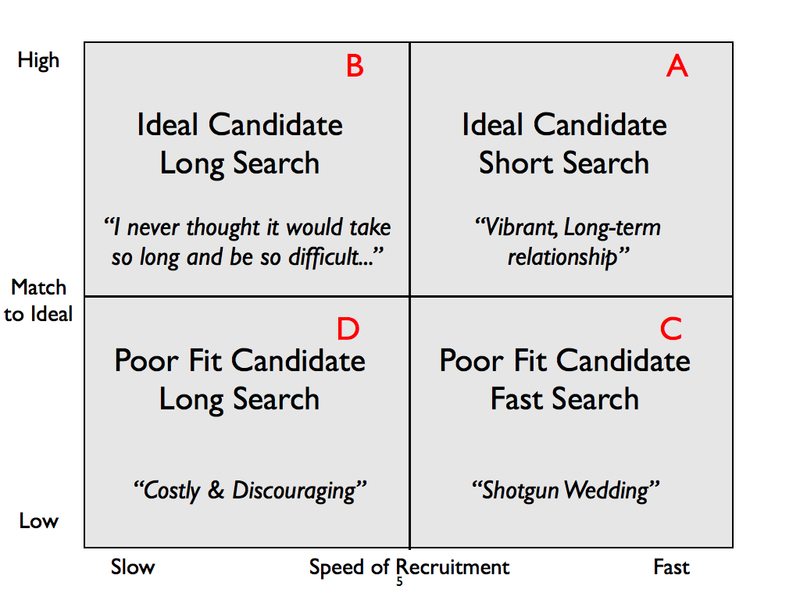 Many lead you into Quadrant C because they’re paid when you hire a candidate they push. Some candidates “look good on paper”, but are a poor fit for your practice. Quadrant B: Outcomes in this quadrant primarily occur because you know what you don’t want. (As opposed to what you do want.) As a result, you waste staff (and your) time disqualifying mismatches. Alternatively, you might know what you do want but haven’t launched the correct marketing techniques to reach them. Quadrant A: These candidates represent true WIN/WIN. You discover “Recruiting Heaven” when you (and your recruiting team) follow a proven process for effectiveness and speed. You don’t wander into Quadrant A or get there by accident. You achieve brilliant results from thorough preparation and the discipline of sticking to a proven process.